Anthracnose is a common tomato disease. Although it can infect green fruit, it doesn't exhibit symptoms of the disease until fruit ripens. It occurs more frequently at cool or moderate temperatures. The same fungus also attacks eggplant and pepper plants. High humidity and rainy conditions greatly encourage the disease. Small circular, slightly sunken water-soaked spots that get darker and deeper or ring markings. Spots can grow to 1-inch diameter or larger. A slightly soft decay occurs as the fungus spreads. Lesions merge into a large rotted area. 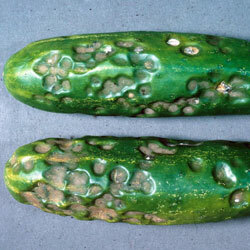 Attacks ripe fruit and appears most frequently on overripe fruits. Caused by the fungus Colletotrichum coccodes. 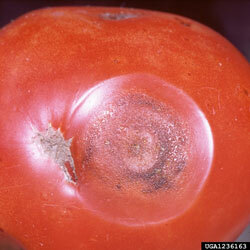 The fungus can survive the winter on diseased tomato plant debri, in the soil, and in seeds. Disease is encouraged by infertile soil. More susceptible when soil drainage is poor. Spores are spread chiefly by water splash. Encouraged by warm, wet weather conditions. Keep plant leaves as dry as possible by watering the base of the plant and avoid splashing onto the leaves. Stake plants and cover the soil with mulching materials such as dried grass clippings, straw, newspaper, or red or black plastic to help prevent splashing from the soil. Keep the area free of weeds and remove and dispose of heavily infected plants. If possible rotate planting locations in a 3- to 4-year cycle to avoid the fungus surviving in the soil. Harvest fruits frequently as soon as they are ripe. Don't leave ripe fruits hanging on the vine. Fungicides are available to control the disease (see suitable products from Amazon.com below). Start spraying with fungicide after the first fruit clusters form and thereafter according to recommended schedule. Apply treatment before the fruit ripens.